Yes, it’s that time of year again when two football teams battle it out for the championship. For those cheering for their home teams, it’s an extra special event. Serious bragging rights are on the line! For the rest of us 100+ million viewers, it’s more about celebrating this national pastime with a kickin’ party! 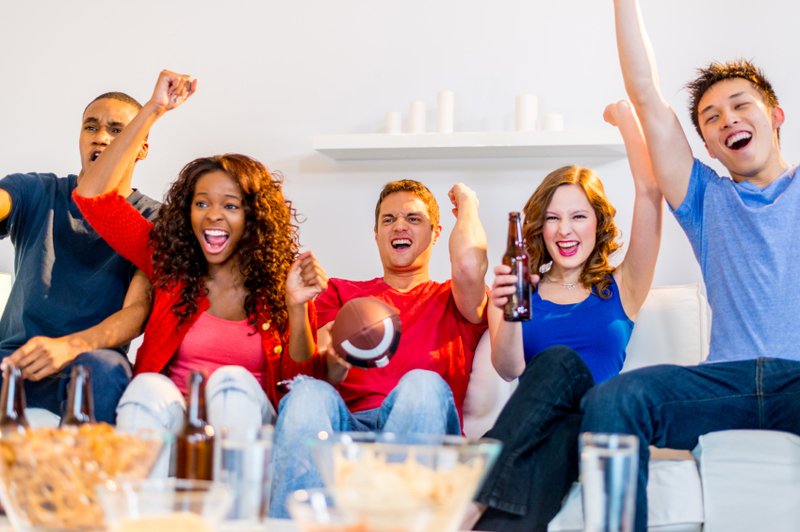 Score your own win with great food, fun friends, and a few extra activities (for those who aren’t as intent on catching every minute of the game). Parties can be quite challenging for those watching their calories or sticking to a healthy eating strategy. Just as you would at any party, take control for yourself by mindfully navigating the food and beverage options to make healthy choices. Watch your portions. No need to consume more than you actually need. Keep the “fixins” on your chili light. Those extra calories add up quickly! Skip the chips. Stick to the raw and roasted veggies. Better yet, offer to bring a veggie tray and make a delicious lower calorie dip. See our suggestions below or search “game” in your DinnerTime Recipe Box for more ideas. Move away from the food. Just because it’s there, doesn’t mean you have to eat it! Friends: It’s fun to get together with good friends to watch the game. Hosting a party in your home rather than watching at the bar gives you an opportunity to include children in the party. Provide a football craft area or other kid-friendly activities so the parents can relax and watch the game. If you are at a restaurant/bar, make a few new friends. There’s a sense of camaraderie that occurs when watching sports and you never know who you’ll meet under these friendly circumstances! Set up a football pool to spice up the contest. If your state doesn’t allow winners to receive cash, just think up something else fun to win! Concentrate on your friends, not on the food. Activities: Not everyone is a big football fan, so having some conversation starters and activities ensures everyone is part of the action. Put on a family friendly football movie, such as ‘Rudy’, in another room for those who may not want to watch the game. Vote on favorite ads. Thirty second advertisements cost $5 million and up. That’s more than $166,000 per second! Before the game starts, screen last year’s top ads. Which were everyone’s favorites? What are the most memorable selections from past years (Mean Joe Green!)? Rank the top halftime entertainment show from prior years (Beyoncé, Bruno Mars, U2, Prince…). Will there be any costume snafus this year with Maroon 5? We’ve come a long way from marching bands! Regardless of who wins, end the evening by congratulating the winning team’s fans, and consoling the losers. Make sure your friends are safe to drive home. 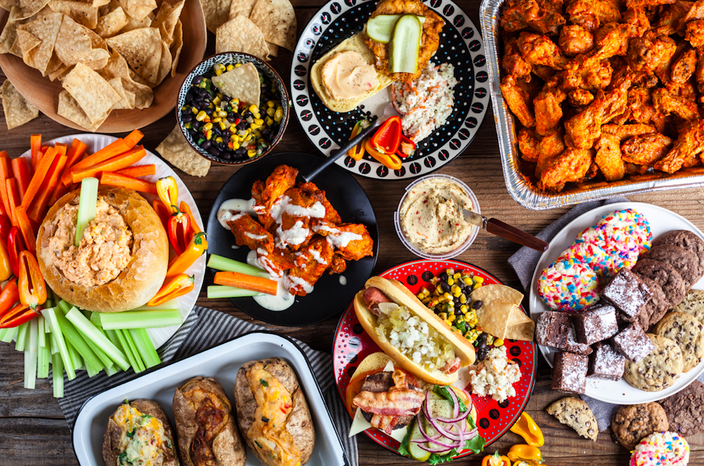 Score and serve these fan-favorite recipes at your football party! New England recipes vs LA recipes, anyone? “Touchdown’ with this take on a New England classic! Pronounced “Lobstah”, this dish is a winner. Can’t beat this yummy dip! Win extra points with this tender salad. Your fans will sure to love these delicious tacos.